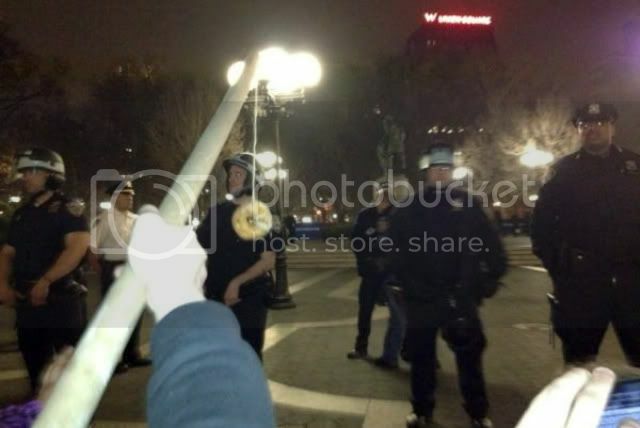 It seems the NYPD's tolerance for public occupations has reached an all-time low. 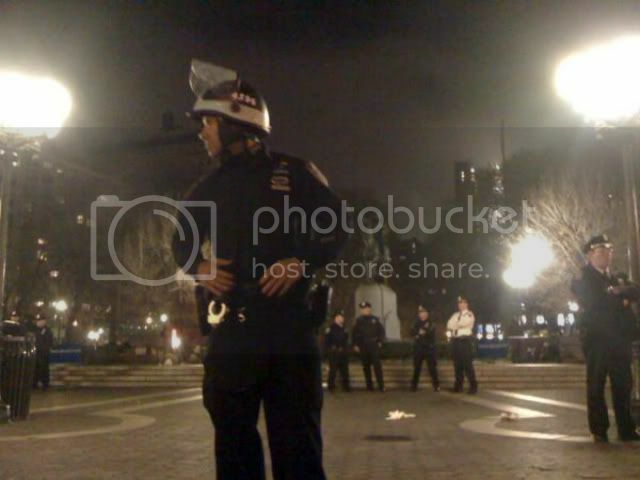 Police evicted the fledgling Occupy Wall Street camp set up at Union Square that I wrote about yesterday, which the OWS website claimed started with about 70 individuals but exploded to 300 early Wednesday. Just after midnight, the NYPD moved in and forced several hundred people out onto the sidewalk, and barricaded off the southern end of the park. At least one arrest *six arrests were made, and according to multiple observers, a protester went into labor during the standoff. "A woman behind the police line just went into labor. Protesters begged 2 let her out 2 deliver. Being lifted into ambulance now," @OccupyWallStNYC tweeted, adding, "I have lived in #NYC for 15 years & I have never seen #UnionSq shut down, not even after 9/11. Who is the terrorist now #Bloomberg?" As has become customary at Occupy protesters, police reportedly filmed the activists' face, which caused some to tweet the need for bringing bandanas or masks for those arriving to "reinforce" the protest, RT reports. Protesters were "understandably uneasy after weekend's brutality," Knefel tweeted, referencing the police violence that occurred at Zuccotti Park during Occupy's 6-month anniversary. "Memory of violence close to surface," Knefel wrote. Gothamist points out, though city parks, unlike Privately Owned Public Spaces (POPS) like Zuccotti, close at 1 a.m., the curfew has almost never been implemented at Union Square. 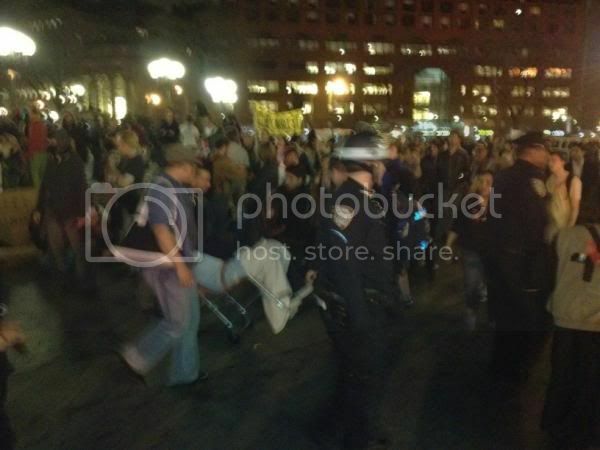 The Daily News reports dozens of police surrounded the edge of the park and at least two FDNY ambulances showed up, fearing violence. 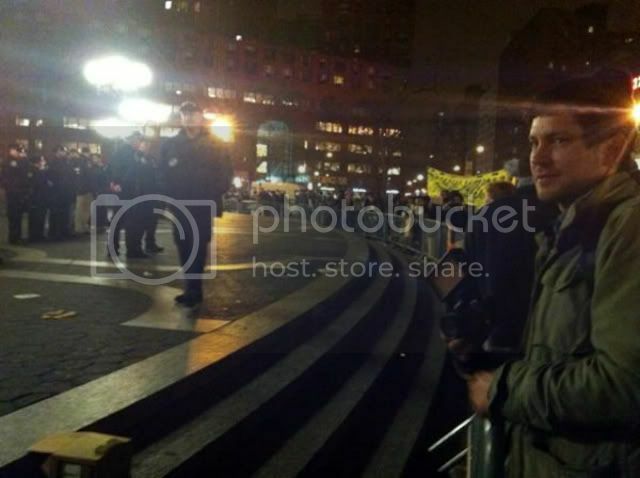 The crowd assembled at the edge of the park, chanting, "Zuccotti is everywhere." 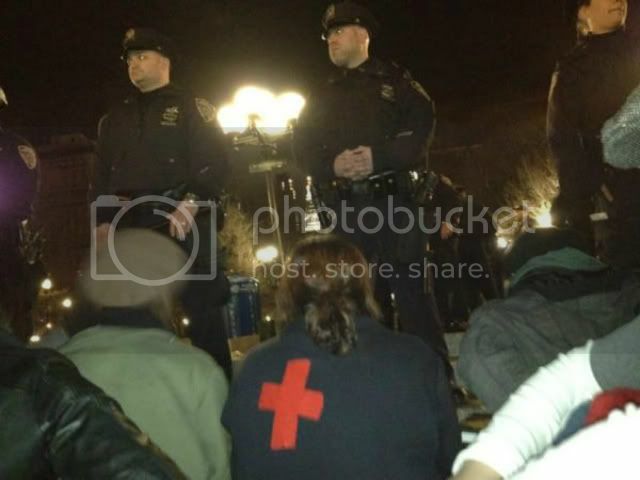 City authorities have said they will tolerate OWS in small numbers, but they cannot sit or lie down in the park if their number goes above 25, the Daily News reports. "What's the long-term plan here, NYPD? To close every park in NYC to the entire public forever? That'll go over well," tweeted @CarrieM213.